Posted by irishelectionliterature in Film, Ireland, Irish History. Thanks to Ronan Mooney for pointing this out in a comment. Here’s a link for a video about Dublin for the 1988 Dublin millennium celebrations. More detail in the video description on YouTube. The old footage might be of some interest to people here. Some great old footage, photos and Dublin History too. A video presentation of Dublin in it’s 1,000th year in 1988. A video produced by Michael Mooney (my late father) & funded by Philips Electronics Ireland to showcase their new ‘VidiWall’ technology. It was narrated by a man named Lar Redmond and the soundtrack was composed by two gentleman named Paul Murphy & Barry Grace (Ear Two Ear). Photographic work was done by Arthur Browne. It was shown in St. Andrew’s Church on St. Andrew’s Street, Dublin 2 for some months to celebrate Dublin’s millennium status. It was a very popular tourist attraction. Dublin was a very different city in 1988. Pay particular notice to the differences in the helicopter aerial footage at the beginning of the video of Dublin’s Docklands from the Dublin we know in 2012. It brings very nostalgic feelings for me and I hope it does for you too! My father was very proud of his hard work to make this video, as were his wife & children. I hope it’ll be a fun video for you to watch now. In case you missed it Conor McCabe has a piece on TheJournal.ie Occupying NAMA buildings isn’t just a gesture – it’s essential research. IELB has already covered it here so just some musings here buildings on his thoughts. It’s early days yet, but am I wrong in beginning to see a stability reenter the system? Thought that stability may only be a across the lifetime of this government, or some portion thereof. But look at the figures. Fianna Fáíl remains becalmed on 18 per cent. This is less than a per cent better than their election result and well within the margin of error. Fine Gael continue their slow decline and have dropped two per cent to 30. There’s a psychological barrier there and once they breach it and descend into the 20s they’re in a somewhat different game. I can’t see any hint of a serious tilt against Enda Kenny, not yet anyhow. But if their poll numbers dropped significantly more and stayed there then he might well begin to feel some heat. Independents are up 1 to 21 per cent. This again is a marginal increase and well within the margin of error but it does seem to point at a consolidation of the Independent vote in the last year. This includes the SP on 1 per cent and the GP on 3 per cent. The latter is probably more indicative of a chance of gains at the local elections, and perhaps some of the FG vote is trickling [or is it dribbling?] to them. Either way the Independents are doing remarkably, historically, unprecedentedly [in the modern era] well. Labour is on 14 and gains one per cent. Again another well within the margin of error gain. But precious little to show for the ‘tough rhetoric’ [which you’d wonder whether it was designed to try to keep some middle class votes on board] and achieving the Presidency – no halo effect there. Labour should be worried. We know that historically their usual figures were in or around 10 per cent, at least during the previous three decades. They’re not quite back there yet, but they soon could be. And that would be in no small part due to their suffering a pincer attack from their left flank from SF and Independents while their right flank sees support more likely to drift to FG. If the idea was that the LP would feast upon the carcass of FF, the reality, at least in the wake of the election is that SF has apparently pried away much of that support which was gifted provisionally to the LP for the election vote. Which brings us to SF, up to 17 per cent and granted that’s a 2 per cent increase and therefore within the margin of error, but still of a piece with other polling data in recent times. It is SF who paradoxically look as if they had the better Presidential election campaign, at least in terms of general political outcomes. And it is they who are consolidating as the ‘opposition’, more so even than Independents who level peg them if one removes the GP and SP vote from that generic 21 per cent. This then is the new stability. A significantly larger SF. A large bloc of Independents. A Fianna Fáil that is unable to make significant headway from its election result. A Fine Gael and Labour who have declined substantially from their election results. Returning briefly to Labour, for years I remember the argument I had with members was which party it should attempt to take out, whether FG or FF. My natural inclination was FG, I always thought their vote was ‘soggier’ and it would be easier for the LP to mount a challenge deep into their middle class [such as it is] territory. Of course history threw a different path in their way, with the collapse of Fianna Fáil. But what we’ve seen is that that collapse has hit a base line, albeit there’s also been no recovery for that party. And that base line is still higher than the LP base line. For the LP the immediate problem has been that while the opportunity to take out one of the larger parties came about, unfortunately it came about during a period when it had much stronger rivals on the left of centre than hitherto. Though that shouldn’t be overstated. It’s barely 12 months ago that Sinn Féin had a parliamentary representation of 5 TDs, and hardly before that that it had only 4 TDs. But then again that party had been sitting on a general national support slightly lower than 10 per cent, something that at some time failing dismal bad luck for them was going to be activated to some extent. And in a way this reminds me of the Green Party, and like smiffy before me, I’m now reading the pretty light Mary Minihan book on their history in government. There’s a time to go into government and a time to stand back. On the current political context perhaps the LP would have been better to pass just as the Green Party before them would have been best to do likewise. But given the constituent make up of the LP, an ageing leadership knowing that it had one last shot at this with any certainty, any delay was unfeasible [though one can counter-factualise a situation where either an FG/FF or FG/Indo coalition would both have been equally unstable]. Still, looking on the bright side that FG vote share isn’t that healthy. Moving back to more usual operating territory, or so it seems to me. It would be a brave person indeed who would argue that an FG overall majority was on the cards next time out. And as those numbers descend, as noted above, the pressure on Kenny will ratchet upwards. . So, what are we looking at? Instead of the 2 and a half party system that was extant up to the 1990s we seem to have a 1 and three halves party system. Or thereabouts. And the seeming monolithic victory and majority that FG/LP offered a year ago begins to seem a little more fragile. With more budgets to come. Reading the response to the comments by Enda Kenny at Davo, what is his take on the crisis? THE FURIOUS, though largely politically manufactured, response to Taoiseach Enda Kenny’s Davos debt comments have a lot more to do with cynically playing to a national inhibition about washing our dirty linen in public than any real belief that Kenny was wrong. Wandering off script, his words were perhaps insensitive, unnuanced and unqualified. Though he should have added, as he has in the past, that government and regulatory failure and bankers’ excess played their part. So in other words his statements were only partially true. And a partial truth is not good enough, not from the elected leader of a state or anyone else. Not when he is implicitly and explicitly blaming the population of that state by no qualification on the term ‘people’. In Davos, according to our correspondent, the response to the Taoiseach’s comments was warm, a welcome for his frankness, and an appreciation of the other part of the message, that there is light at the end of the tunnel. One veteran Irish Davos-attender described the criticism as “ludicrous”. And what of this unlikely suspect? Maybe it’s me but when you’re looking to Denis O’Brien for validation you’re not in Kansas anymore [and the IT should perhaps know better given a certain spot of unpleasantness in the not too distant past over a certain columnist and the termination of their contract]. By comparison with other countries, moreover, a study by consultants McKinseys finds Irish household debt (as a proportion of GDP) currently running 57 per cent higher than the average in “mature economies”, and only marginally better in respect of Spain and Portugal. Of the two other countries associated with the euro zone crisis, Greece and Italy, household debt here is double the former, and 2½ times the latter. There is an argument currently being made in some quarters that the austerity being imposed on the Irish public is entirely about bailing out German and European banks who irresponsibly lavished us with cash, tempting us to borrow and spend beyond our means. And that they are entirely culpable for the mess we are in – we owe them nothing. But as German ambassador Dr Eckhart Lübkemeier put it bluntly at a meeting in Trinity on Thursday night, “it takes two to tango!”. Borrowers have a moral responsibility too. That’s a nice convenient line. ‘Borrowers have a moral responsibility too’. But borrowers are – generally speaking, and I’m not talking about certain classes of them – at a disadvantage in this context. They must take a risk and often from a position of inadequate knowledge. A while back I had to shift from a DCC shared ownership mortgage to a commercial mortgage. Work needed to be done on the house and DCC did not provide any facility for top up of mortgage – as handy a mechanism for jettisoning property into the commercial market as I can think of [and what kills me is that when the deeds of the house were signed over jointly to DCC at the start of the process in the late 1990s the man from DCC who was doing so said that he hoped the house wouldn’t be sold on rapidly. That was never the intention and I share[d] the sentiment but to see the property leave partial social ownership was a bitter pill for me to swallow]. Anyhow when organising the ‘new’ mortgage I asked the person dealing with it what they thought the risk was. They assured me it was fine, but then stopped and admitted that there was a risk if jobs were lost or the economy went further south or interest rates rose substantially [and at the time, about two years back this seemed highly likely]. One of those circumstances could probably be dealt with, but not all of them together. In other words in a reasonably stable economy such a risk is just about manageable, or if one has savings or the sums involved are low. But in an economy in a boom situation such risk is much less manageable. The realities of our addiction to personal debt in recent years are deeply disturbing. CSO figures show that between 2001 and 2008, while GNP increased by some 56 per cent, household loans (including mortgages) soared 245 per cent. Borrowing has tailed off a bit since the crisis, but remains at just below historic highs. Economist Cormac Lucey cites a US study which argues that when household debt exceeds 85 per cent of GDP it becomes a drag on growth – in Ireland that threshold is exceeded by 50 per cent. It was a boom. The outcomes as we have seen have been disastrous. Yet who precisely was shouting stop during this period? Well, it wasn’t the ECB, the EU – and the IMF was remarkably silent about these matters. Far from the Irish economy being a source of overt, or even covert, concern, this state was regarded as exemplary, a model for emulation and so on. The political classes – that is the three/four largest parties then extant – were as one, with only marginal unease, in agreeing that the status quo was to be continued. Remember Labour’s proposal to cut the lower rate of tax in 2007? And Fine Gael, led by one E. Kenny can take no pride in statements raising concerns over the situation either. The media? Well we’ll discuss that in a moment… but what of the effects on ‘people’ in this environment? As a friend in the public sector said to me ‘no one ever thought wages would be cut’. No one did. No one in the general economy – I worked for a private enterprise that some years before I arrived had tried to cut wages, this in the very early 1990s or late 1980s. The staff rebelled. Wages might remain static [which of course is a cut], but they rarely went down, short of unemployment. And what talk there was of change was of ‘soft landings’. Well the Irish Times itself is open to charges of massive hypocrisy on this issue. Some will recall how during and before the Celtic Tiger period the Irish Times led the cheerleading with property supplements that were deliberately designed to generate enthusiasm in a market where ever increasingly stratospheric prices were regarded as the ‘new normal’. Some might also recall that the Irish Times was the media organ which didn’t merely restrict itself to such rhetorical, though frankly I think its influence was far from rhetorical, activities but also purchased a property website. For it now to argue, as it does, that somehow the credit problems were in some respect intrinsic to our nature, that it was a ‘madness’ which descended upon an Irish people who only now are in recovery, and that only through the ‘tough decisions’ is a profound evasion of its own centrality [and that of the media in general] to this process. So that is the context. Borrowers in a context where in order to buy into a market where prices were increasing ludicrously, in no small part due to the prodding a collusive media and political and economic circles, had to expose themselves to absurd risk. I’m 46, I’m cautious by nature in financial matters and I had the memory of the 1980s, and God knows part of the 1990s, to make me even more cautious again. Add in an antipathy to banks, and media and economic tropes, in large part guided by socialism and I’m the antithesis of the target market for borrowing. But if it were otherwise, if I was less sceptical, less risk-averse [and note the contradictions in the messages we are being bombarded with, on the one hand ‘we’ went ‘mad’, on the other our supposed entrepreneurial class are reified for their ‘risk-taking’] there but for the grace of who knows what might go I – and many others, well they went. None of which is to excuse the crass stupidity of some involved in the process, the fact that there was greed, but for the Irish Times, given its role in all this to try to point the finger at ‘people’ is inexcusable. Wouldn’t it have been refreshing if at the Davos assembly of very important people, Kenny had said something like the following: ‘the Irish crisis was caused by internal and external factors. We certainly mismanaged our own internal affairs and that cause the fiscal crisis, and we will pay whatever we have to pay to rectify that [aligning with EU norms on taxation would be a good start there – wbs]. But there were external factors also for which we do not – and did not – have responsibility. The low interest rates in the eurozone were appropriate for Germany but not for Ireland. It was partly under pressure from the ECB that we gave the bank guarantee in Sept 2008, and that has cause a massive burden of private bank debt to be inflcted on the Irish people. We have been told that were we to default even marginally on this debt the consequences to us would be calamitous for it would destabilise European banks generally. So to protect that stability Ireland has to bear an enormous burden alone. This is wrong. It has to be European wide burden sharing and I am going to insist on that at the EU Council meeting on Monday. It’s bad enough that Kenny cannot make a statement like that, but then again who expects a rather tame Irish Christian Democrat to go up agin the big guns? It’s just not part of his political make up. But for the Irish Times to be unable to see the necessity for him to transcend the entirely self-serving rhetoric [from both his and the ITs perspective] of his actual statement tells one all that is necessary as regards their true concerns in these matters. Irish agrarian radicals, c. 1850–1930, 22 and 23 March, National Library of Ireland. Posted by irishelectionliterature in British Politics. There’s a nice Gallery in todays Daily Mirror With some political Posters from a exhibition at the Peoples History Museum in Manchester . BBC History Magazine has a few more and the Peoples History Museum even has its own blog related to British Election Posters. All well worth a look. Posted by WorldbyStorm in Irish Left Online Document Archive, Miscellaneous Documents, Miscellaneous Left Publications, Official Sinn Féin, Progressive Unionist Party, Sinn Féin. 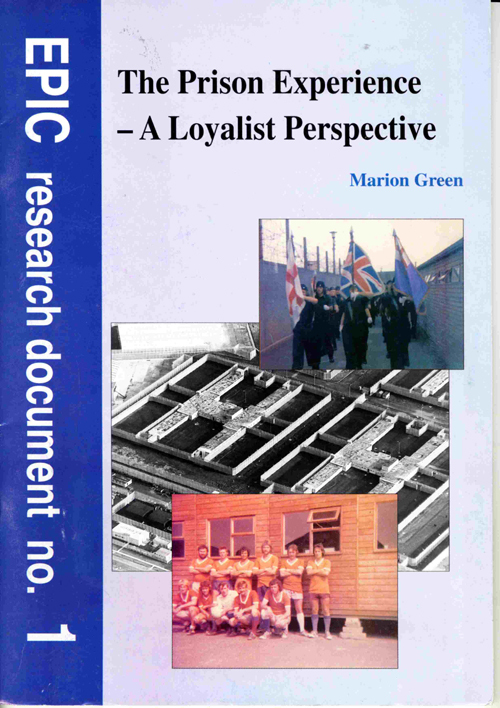 This document [and many thanks to the person who donated it] may seem at first sight an unlikely one to be part of the Left Archive, however it provides both an overview of the general conditions and history of the prison system in Northern Ireland for political prisoners – Loyalist and Republican, and also gives an insight into the relationships between both as well as a developing political consciousness on the part of the former. The Preface notes that EPIC ‘as a community based self-help organisation welcome [new arena’s for addressing differences and representing communities] and will continue to give our support to these latest developments at the political level, we are also conscious of the impact and legacy of violent conflict at community level’. EPIC has taken responsibility to assist in the reintegration and transformation of ex-prisoners who engaged in the violent conflict. As an integral part of this work EPIC has undertaken intensive research into prison-related issues – whether describing the background to the prison experience itself, or cataloguing the many predicaments, problems and concerns which politically- motivated ex-prisoners encounter upon release. For the past thirty years there have been thousands of Loyalists incarcerated in NI’s prisons and yet very little has been written about the subject. That neglect is all the more noticeable when one considers the number of books and other publications which have appeared dealing with Republican prisoners. Just as remarkable has been the crucial impact former prisoners and their associates have made upon the political process – a process once kept remove from working class aspirations and interventions. Within the Loyalist working-class community parties such as the Progressive Unionist Party and the Ulster Democratic Party have done much to help move this entire society away from the politics of intransigence and violence to the politics of accommodation and dialogue, while proving that no surrender of identity or aspiration need be involved in the process. Inside the document there is a chronological approach, with sections addressing ‘The Early Days: Crumlin Road Jail’ – with interesting anecdotes about how the various paramilitary groupings had to liaise in order to maintain discipline, ‘Internment and Long Kesh’ – and demands for political status where, as is noted, ‘we didn’t get much help from the UUP or the wider unionist population’, ‘Early Prison Protests’, ‘Coping with Life inside’, ‘Fighting Criminalisation’ and so on. Not all the prisoners were interested in politics, some just wanted to get on with their sentences, but a small number of men were interested and they got involved in political debates and discussions, not only with fellow Loyalists but with Official Republicans. The sense of the prison experience as a crucible for ‘fresh political thinking’, as the document puts it, is strongly reinforced by these observations. Just got news Brian Hanley was/is on tonights History Show on RTÉ Radio One discussing the impact of Bloody Sunday in the South It can be found online here in the next couple of days or so. Posted by irishelectionliterature in Ireland. These videos seem to be popping up fairly regularly now and I must say I love them. The Blurb with this one. Snapshot in time of Dublin City Centre probably about 1958. Taken by my Dad while driving and walking in Dublin city centre. Clip shows Trinity College, Nassau Street, Grafton Street, St Stephens Green, O’Connell Street Bridge and College Green finishing inside St Stephens Green. Much though I hate to disagree with our esteemed President, on Hayek, I have to. Far from being discredited, Hayek is our inspiration now. It was he who showed how state intervention — the US Fed and Bank of England setting ultra-low interest rates in the Twenties — contributed to the Great Depression, and how, far from causing recovery, Keynesian economics resulted in the US economy sliding back into recession in the late Thirties. Likewise, low interest rates and sub-prime mortgages a decade ago caused this crisis. Last week’s temporary pick-up in US growth is less a sign of recovery and more a sign that quantitative easing has moved from being a needed and justifiable tool to save the US financial system to an unsustainable counter-productive tool for pump-priming US domestic demand. Hayek shone a beacon against the forces of state tyranny, forces that led ultimately to totalitarianism, evil and war. Marc Coleman. Just after the bit I’ve quoted, he goes on to complain about the Front National. I’d like to say he’s just ignorant of Hayek and Pinochet, but he probably just doesn’t care.